Amid crippling social inequality, political unrest, and unprecedented numbers of migrants fleeing violence, Central American countries have yet to successfully address the obstacles to peace, justice, and prosperity for the majority of their citizens. The increasing unrest in Nicaragua, with the Ortega government’s violent repression of protesters, is but one of the recent crises destabilizing the region. 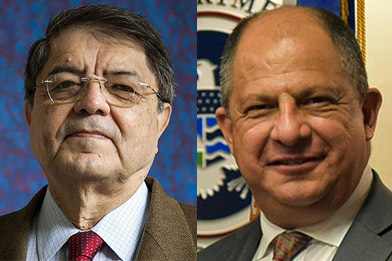 In honor of the newly launched Cátedra Ernesto Cardenal, LLILAS Benson will host an exchange of ideas between Luis Guillermo Solís, former president of Costa Rica (2014–18), and Sergio Ramírez, former vice president of Nicaragua (1985–90) and winner of the 2017 Cervantes Prize in literature, the most prestigious literary award in the Spanish language. The event will take place Wednesday, January 30, 2019, at 4:30 p.m. in the Bass Lecture Hall in the LBJ School of Public Affairs on the UT Austin campus. RSVP here. Event co-sponsored by the Latin America Initiative at Texas Law. View excerpts of our interview with Ernesto Cardenal at his home in Managua. Solís and Ramírez will have an unscripted conversation about the most pressing issues in Central America, touching on the crisis of democracy in Nicaragua under the Ortega regime, continuing social inequality and crime in the region, immigration, and challenges and opportunities in the relationship with Mexico and the United States. Costa Rica’s most recent former president, Solís is also an academic, author, and educator who is an expert on international relations and civil society. His publications include Centroamerica: La integración regional y los desafíos de sus relaciones internacionales (2009). Ramírez is the author of over 20 novels and books of literary nonfiction, including Adiós Muchachos: A Memoir of the Sandinista Revolution (Duke, 2011), his best-known work translated into English. Gordon Dee Smith, founder and CEO of Strategic Insight Group, a private intelligence company, will serve as presider. Smith is vice-chair of the LLILAS Benson Advisory Council. The forum will allow time for audience questions. Each year, the Cátedra Cardenal will provide two fellowships of up to $3,000 for a short-term stay in Austin to carry out Central America–related research at the Benson Collection. The 2018–19 competition is already closed. Information about the competition and the archives available for study can be found at LLILAS Benson Cátedra Ernesto Cardenal.